At Divinum Auxilium Academy the children begin their journey in a beautifully prepared Montessori environment directed by an Association Montessori Internationale trained directress. Upon completion of the Kindergarten year the children then transition to a more traditional academic setting. In the Academy’s Pre-Grammar and Grammar schools they will begin the rich and rigorous training in the Classical Liberal Arts, while retaining a Montessori experience of the environment and orientation to their unique plane of development. 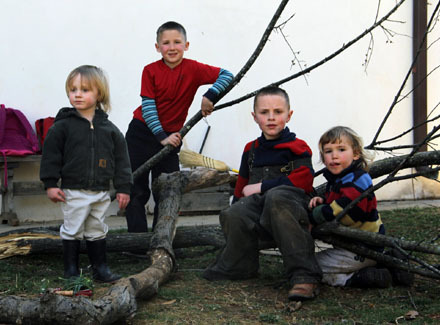 One of the main applications of this orientation is in the multi-age classroom experience, which allows for the unique interaction observed by Montessori between children of different ages: a beautiful and supportive interaction between youngers and olders, which all but disappeared in classrooms of segregated ages as we have now in most public and private schools. Interestingly, this is similar to the model of the one room schoolhouse and master teacher model found in the Classical schools of old. We believe that the Montessori and Classical methods are entirely compatible in their approach to the development of the human person. Indeed, we feel that an early Montessori formation uniquely prepares the young child for the study of scholastic philosophy found only in the Classical tradition, and all of the riches contained therein. Aristotle wrote that the path to knowledge begins in the senses before ascending to the realm of the mind. This is reflected in our curriculum as the students move from the hands-on, tangible approach of Montessori to the more rigorous and intellectual concepts of the Classical liberal arts. This is perhaps the one for which Montessori is best known. A typical Montessori classroom is filled with materials that are created from the recognition that the basis of human knowing is the senses. The senses are the only “way in” to that highest part of the human soul which knows things. Sensation is in itself a kind of knowing. Now of course, people sense things all the time. Regardless of what they are doing, they are inundated with sensations of all kinds. So what is so special about the way that this is done in a Montessori classroom? The basic answer is that with the use of materials made for specific purposes, it does three things. It simplifies, focuses, and guides sensation. By focusing sensation on a particular object or activity, it simplifies and purifies our natural experience, so that instead of experiencing twenty things all at once in a confused and undifferentiated manner, the student is able to experience a simplified and concentrated version of a particular reality, and therefore better able to get it “inside.” To take a drastic example that we have all experienced, when we put our hand on a hot stove, we are still having lots of other sensations — we still hear and see and smell other things. But that pain that we feel in our hand, because it is so strong, focuses our attention on just one thing, and thereby we learn not to put our hand on the stove again. 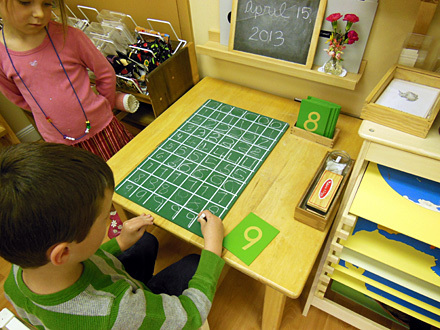 Along with focusing sensation, the materials and methods in a Montessori classroom are designed to guide sensation. In other words, the focused sensation we spoke of above has a specific goal. To take one of the simplest examples: If the goal is, say, to learn how to write cursive letters, the students may begin by using the materials known as the “sandpaper letters.” Because these sandpaper cut-outs have the rough texture of sandpaper, they provide for the students who trace them with their fingers the focused sensations of feeling and motion in their finger — the very same finger that will one day be holding a pen. Because these cut-outs are in the shape of the cursive letters the hand, as well as the imagination and the mind, are learning the shapes of the letters, and how to create them by the motion of the hand. In addition, the child is hearing the sound of the letter symbol and is invited to repeat that sound while tracing. Thus, the child utilizes the senses of seeing, hearing and touching all in the application of learning the letter symbols, their relative sounds and the direction of the hand in forming their shapes. What all of these materials are doing then is simplifying, focusing, and guiding the students’ sensations such that the students are a.) learning, by being focused and b.) learning what the teacher wishes them to learn by being guided. Human knowing has order and is age-appropriate. Recognition of the developmental nature of human knowing, particularly in children, is a hallmark of Montessori Education. Age Appropriate LearningThe classical tradition of learning as embodied especially in Aristotle’s discussion of the matter in his Nichomachean Ethics, recognized that the correct order of learning is in part determined by the development of the student. In plain English — teach a student what they need to learn when they are best able to learn it. Children learn their native language almost painlessly because they learn it at a stage when they are particularly receptive to it. Anyone who has tried to learn a second language later in life knows that it is two things: 1.) possible, but 2.) incredibly difficult. Just as some people are more able to receive certain truths, so certain periods in a child’s development are more open to receive particular truths. Montessori developed this observation by identifying several different or “sensitive” periods in a child’s development and attuning her methods to the child in each stage, instead of trying to attune the child to some preconceived method. Each developmental period was defined by the type of knowledge and learning to which the children in that developmental stage were particularly apt to receive. Human knowing is part-by-part and step-by-step. The classical method of study can almost be defined as the art of dividing things up correctly. Dividing a subject or a problem up into its parts and steps and hierarchy is the whole architecture of the classical system. Why? Simply because that is the method of doing things that is appropriate to human knowing. Humans are not Angels, whose intellects know all they can know about an object immediately. Humans know things part by part and step by step. This is seen even in the most basic building block of all our knowledge — the syllogism, which is a three step process. I know All A is B and I know all B is C. By seeing these two in their parts and order and relation, I can draw the conclusion that all A is C.
In Montessori, this basic characteristic of human knowing is applied not only to the abstract, but even to the concrete functions such as reading and writing. For example, there is a lot that goes on when you write your name. There is the way you hold the pen, the motion and strength of your hand, your memory of the letters, the knowledge of what your name sounds like, and the knowledge of how those sounds translate into written letters, etc. By correctly dividing up and ordering these many parts, the work of learning to do the complex begins with what is most basic and builds from there. Human knowing moves from concrete to abstract. Along with the movement from the simple to the complex, there is also the movement from the concrete to the abstract. This is not commonly held in most modern teaching methodologies, as is evident from the fact that when something is described as “abstract” nowadays it is almost always a negative criticism. However, both the classical tradition and the Montessori method recognize that the goal of all human knowing is the formation in the learner of abstract knowledge, that is, knowledge of universals, since only universals are unchangingly true. The easiest way to see this is in the area of mathematics and geometry. After doing several concrete examples of two beads and two beads making four beads; and two cows and two cows making four cows, we are able to “abstract” (literally — to draw from) the concrete particulars, the universal unchanging truth that 2+2=4. This principle motion of human knowing — from concrete particular to abstract universal — is recognized and practiced in all levels of the Montessori method. The Teacher is a Facilitator, not a Dictator. Finally, one very, very important likeness between the Montessori method and the classical understanding of learning is in their shared view of the role of the teacher. St. Thomas in his De Magistro summarizes the classical view of the teacher-student relationship in the analogy of physician and patient. A medical doctor does not create health in the patient. Why not? Because the patient’s own body/soul composite has a nature that already “wants” health and it is the only thing that can create health in the patient. The doctor’s role is simply to recognize what it is that nature already intends and to aid and assist nature either by removing obstacles or by creating a better environment for the body/soul to do what it already was created to do. Likewise, the role of the teacher or guide is not to download information from his mind into the mind of the learner as some sort of extrinsic cause. Rather, it is the learner himself, and only the learner himself, who can come to possess knowledge by his own activity. Thus the teacher-guide is there to organize things such that the student can arrive at true conclusions by their own activity in an efficient manner. At Divinum Auxilium Academy we strive to help guide each child to his or her fullest potential in this holistic and supportive way.